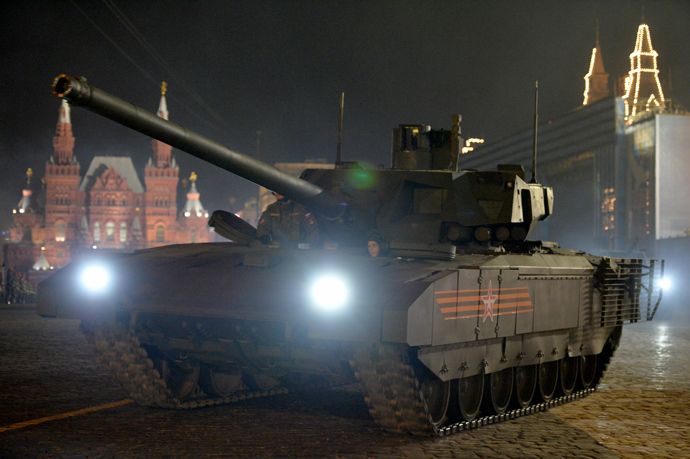 It made an impressive debut during the Victory parade in Moscow, Russia’s brand-new ‘supertank’ is still shrouded in mystery, and has proved a magnet for rumors. Here is what we know for sure. 1. Armata is not the name of a tank, but an armored platform, onto which modules will be fitted to create more than a dozen vehicles. Besides the T-14 battle tank, it will be the chassis for a personnel carrier, self-propelled artillery and an air defense system. 3. Armata T-14 features a fully automated and unmanned turret – perhaps the most revolutionary technological decision taken by its designers. In theory, this should allow better protection for the crew, now located in the hull, though the innovation could come at the expense of situational awareness. 4. 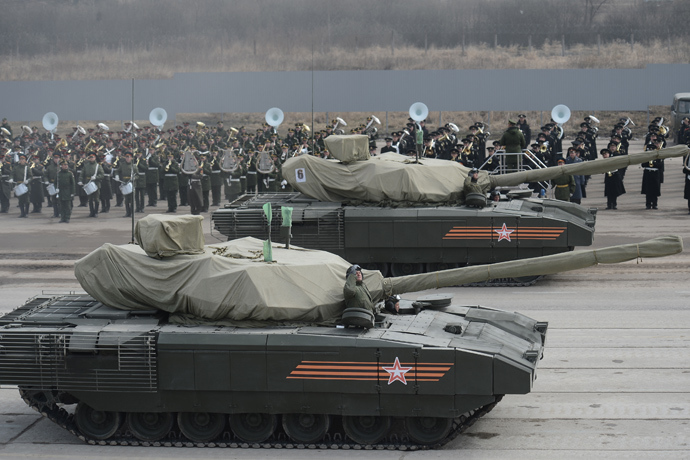 In fact, due to its new-generation turret, and a field of vision which is created by HD cameras and sensors mounted all around, Armata is well on the way to becoming the first unmanned battle tank, according to sources in the Russian defense ministry, with only limited modifications necessary to turn it into a ground-drone. 5. One of the future modifications of the Armata tank is to be fitted with the long-awaited massive 152 mm gun, which will be able to “burn through a meter of steel,” according to Russia’s top defense procurement official. 6. The ambitious Afganit Active Protection System uses a radar to detect incoming projectiles, and automatically intercept them. While its exact parameters are unclear, Russian sources say it could stop missiles launched from an Apache helicopter, while US Army experts say the defense will mostly be effective against grenades and sub-caliber projectiles. 7. Lighter than most Western tanks, the T-14 retains one of the trademark qualities of Russian armored vehicles – a higher top speed. The tank is able to move at up to 90 km/h, more than 20 km/h faster than the US mainstay Abrams M1A2. 8. Though it is not yet in mass production, the Armata T-14’s price was previously estimated at about 400 million rubles – $8 million at current exchange rates. While this puts it in the upper price range for battle tanks, it remains cheaper than the French AMX Leclerc and US main battle tankM1A2 Abrams, and below the price of other new-generation vehicles, such as S.Korea’s K2 Black Panther and Japan’s Type 10. 9. The Russian military is currently operating 20 prototype models of the tank, but will soon start receiving more than a 500 a year, with the eventual order expected to top out at 2,300 – more than two-thirds of its armor capability. 10. 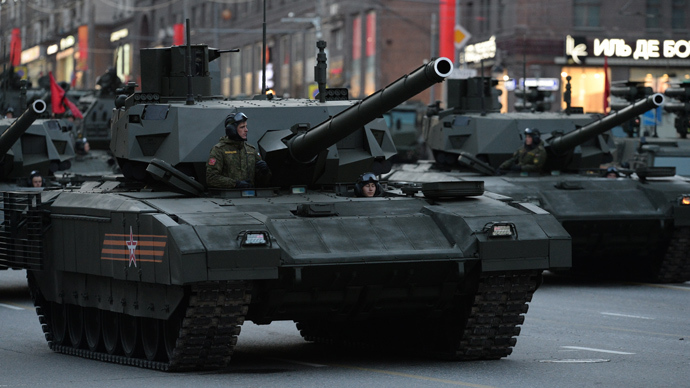 India, which is already the biggest buyer of Russian armor, could be the likely first foreign client for the Armata – which will supersede the T-90, of which it operates more than 900 – with China, rest of Asia and North Africa some of the other potential destinations.